each year, south africa’s design indaba conference, among creative professionals, invites 7 young emerging designers from across the globe to present their work and experiences through a pecha kucha-style talk. canadian designer rahim bhimani was among them. an individual who thrives on solving problems, bhimani traveled to lota, chile after the 2010 earthquake, and began examining the sanitation issues which hit the area following the natural disaster. currently, 2.6 billion individuals around the world lack basic sanitation needs and the inhabitants in lota were using chemical toilets, shipping container bathrooms and buckets as their bathroom facilities, options which are either poorly maintained or pose health risks. 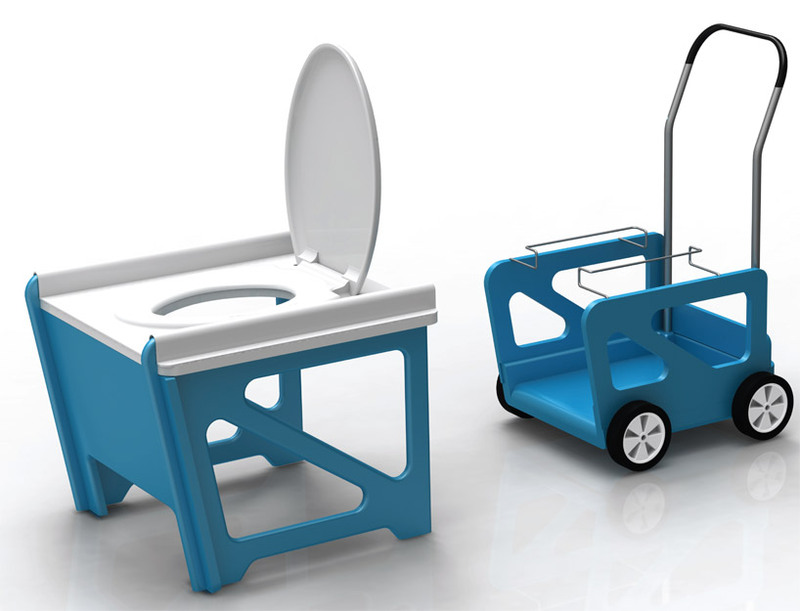 as a response, bhimani developed the disaster relief toilet system, as a means of providing sanitary toilet facilities for those in affected regions. the flat pack system aims to make it easy for individuals in disaster stricken areas to assemble and maintain. the pieces slide together and are fastened by 10 slot head screws – hardware that does not require a screwdriver, but instead can be twisted with a butter knife or coin. once assembled, a high-performance degradable bioplastic bag can be attached. each bag can hold 100-150 (has a volumetric capacity of 13 gallons or 45 litres) uses before it needs to be replaced. the interior of the bag is coated with a layer that keeps the odor contained within the bag. to empty the cart, the draw string at the top is pulled shut and the cart is rolled to a nearby hole where it can be dumped.